In developing a range of commercially important conjugated organic materials including light emitting diodes, photovoltaics and field effect transistors, a research team at the University of Manchester needs to quickly and reliably analyse molecular properties, which they do both computationally and experimentally. Part of Dr Michael Ingleson's research develops new synthetic and catalytic methodologies for creating conjugated boron containing organic molecules. These are complex materials that can be used in manufacturing light emitting diodes (OLEDs), photovoltaics (OPVs) and field effect transistors (OFETs), for a wide range of commercial applications including display screens, energy capture, and medical sensors. The EPSRC UK National Service for Computational Chemistry Software (NSCCS) helps this research team to predict and validate molecular properties, uncover potential design flaws, and develop new research directions, enhancing the value of their research for industry partners. Michael Ingleson obtained his first degree (Chemistry with Industrial Training, 2001) and his PhD. (organometallic chemistry, 2004) from the University of Bath. Postdoctoral positions followed at the University of Indiana (USA) and at the University of Liverpool. In October 2008, he was awarded a Royal Society University Research Fellowship held at the University of Manchester to research in the areas of main group chemistry and catalysis. In 2011, Mike was awarded the Young International Boron Chemist prize at IMEBORON XIV (awarded by vote to an under 35 years independent boron chemistry researcher). In 2012, Mike was promoted to Reader and was awarded the RSC Harrison-Meldola Memorial Prize for his innovative work in borocation chemistry, particularly the borylation of arenes. The Ingleson Group develops new synthetic and catalytic methodologies for synthesising conjugated boron containing organic materials. These materials are fundamental to devices such as organic light emitting diodes (OLEDs), organic photovoltaics (OPVs) and organic field effect transistors (OFETs). Validating these organic materials is time-consuming and requires substantial computing power. Dr Ingleson estimates that a typical desktop computer would take over a week to calculate the properties of one of their molecules. The Ingleson Group uses the high performance computing, Gaussian software and training workshops provided by the NSCCS to carry out their computations. Training is provided to researchers at all levels, from those with experience of computations to total novices. These computations are performed both before the experiments in the lab, and post-experiment, to improve and fine-tune a molecule's design. Industrial applications of organic conjugated materials include OLEDs, used in mobile phone and display screens, and which are predicted to have a global market of nearly $44bn by 2020. Other potential applications are biological, where red and near-infrared emitters could help trace drugs and conditions in the body. "Computations help to guide the development of new synthetic routes that are cheaper and avoid toxic transition metals. Insights we've gained through working with NSCCS have enabled us to identify a second generation of reagents that are more effective." Dr Michael Ingleson's research includes discovery of new methodologies for synthesising conjugated boron containing organic materials. These materials have properties that are attractive in producing a range of devices used in industry, such as OLEDs, OPVs and OFETs (see bullet points). This research, based at the University of Manchester and involving a number of PhD and post-doctoral researchers, involves designing large organic molecules both in silico (in computer) and in laboratory wet chemistry experiments. It requires detailed computations to verify that a molecule has the properties desired for it, or to identify problems in functionality that may lead to new research angles. 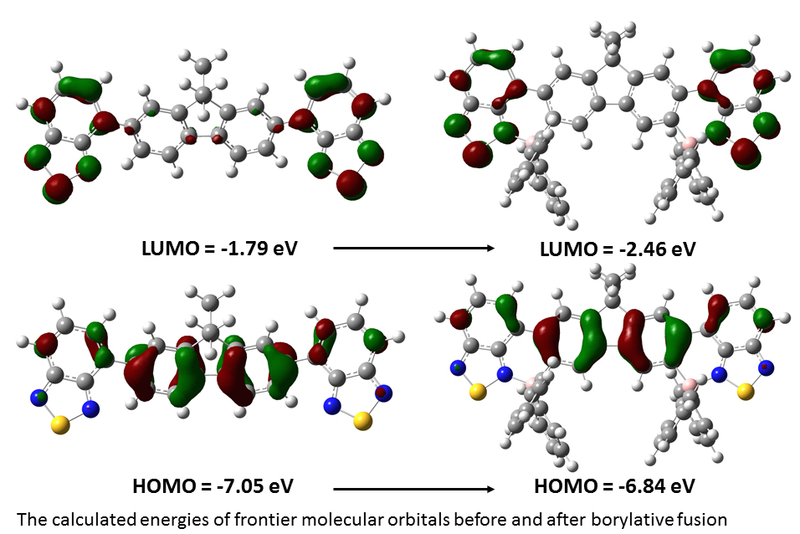 Molecular properties that are tested in this combined approach include frontier orbital energies and character, aromaticity (via e.g. NICS calculations) and excited state energies. It is essential to establish these properties reliably to verify a material's suitability for industrial applications. The computational analysis requires specialist software and high performance computing provided by the EPSRC National Service for Computational Chemistry Software at Imperial College London (NSCCS). In addition to computational resources, NSCCS's workshops provide software training to Dr Ingleson's growing research team. The team have used NSCCS tools and training to pursue multiple projects. One is to discover new ways to make important synthetic intermediates, for substances widely used in the agrichemicals, pharma and materials sectors. "Computations help to guide the development of new synthetic routes that are cheaper and avoid toxic transition metals," says Dr Ingleson, who is Reader and Royal Society University Research Fellow at the University of Manchester School of Chemistry. "Insights we've gained through working with NSCCS have enabled us to identify a second generation of reagents that are more effective." Another important use, in partnership with companies such as Cambridge Display Technology, is to help fabricate new materials such as borylated oligomers and polymers for semiconductors used in electronics. "These highly conjugated, organic molecules that have particular physical properties are useful for example in organic light emitting diodes (OLEDs), organic field effect transistors (OFETs) and organic photovoltaics (OPVs)." "You need to know trends in their key properties. You can assess these properties using high-performance calculations," Dr Ingleson adds. "They reveal information on the energies and on the nature of the molecular orbitals." How does NSCCS help validate this research specifically? "Sometimes you come across unprecedented reactions and you try to find a plausible mechanism of how reactant A converts into product B," he adds. "The wet chemistry is done first and you use calculations to rationalise the often broad range of outcomes," Ingleson explains. "Then you have a first generation reaction or material that you want to improve. You make predictions about how things will work better and you test some key properties. We use the NSCCS supercomputer service to run calculations at a very high level on a number of these to guide development of the second generation of reagents / materials." The computations use the Gaussian software. The research team requests CPU hours, they upload input files onto the NSCCS computer, and because of its speed the calculations are run in a practical time period. "If you tried doing these computations on a typical desktop PC with an Intel Core processor it would take several days, perhaps a week," says Ingleson. Training is essential The University of Manchester has its own high performance computing facilities, but Ingleson's group says it does not have the expertise to run their computations on such a computer without the additional training and specialist support provided by a facility such as NSCCS. Their primary expertise is making molecules. For Dr Ingleson, the training element of NSCCS is very important for the PhDs and post-docs working in this field. NSCCS provides training for researchers with different knowledge of the computations. "Computational training is particularly important for PhDs with no experience. For people with some knowledge of Density Functional Theory (DFT) calculations, NSCCS can help them improve. Or they can go in as total novices and ask for full tutorials. We have sent both. It is an irreplaceable service." The Ingleson Group's research has a variety of applications. While OLEDs are increasingly the basis of display screens for electronic devices, the molecules that this team makes can also be used in red and near-infrared (NIR) emitters, which are of considerable current interest because of applications in night-vision, chemosensing, infrared signalling and optical telecommunications, says Ingleson.